A continuation from the last post…the Rainbow and the Withlacoochee merge near where we put in, so on the way back to our car, we decided to take a deviation from the Rainbow. We found a small canal where we could slip through, and headed up river. And what a view! It was such a difference, coming from the close shores and overhanging trees, to this wide river. The water was fantastic, dark and tea-like. Such a joy to be out on it- rather than just admiring it from the shore. We paddled up river for a half mile or so, and came across the old train trestle. There is a short trail off CR 484, that follows the old train tracks, and leads to the Withlacoochee, we have never followed it through, so didn’t realize that anything was left of the trestle. I wished that I had, a better camera with me, there were some really fantastic textures on the concrete and metal, and it would have been nice to capture them for future use. 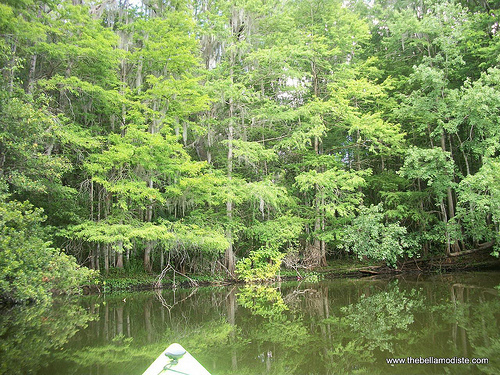 Then of course- what is a trip to the deep dark Withlacoochee without seeing an alligator? He was huge! Nearly a whole foot long…and adorable as could be! In the same little inlet that we saw the alligator, was this amazing spot, with the prettiest lighting- you would have thought it was early morning, how the light streamed just so through the leaves. Coming back down river, we pretty much just drifted, enjoying the afternoon and the river. We are looking forward to hitting the river sometime soon again, now that it is cooling off, and fall is here. I’ll get back to crafty posts soon! Quite a trip – plenty of great photos! Those would make lovely textures, the sides of the trestle, all the detail and weathering. And hopefully you’ll get to go back sometime soon – I’m sure that it would be fantastic out now! I was just checking out your personal website and came across your withlacoochee river excursion. I took the boat ride and put together this video of my photos from the trip.